Over the last few months, I have encountered a unique situation with my next door neighbors. Apparently, they have become increasingly bothered by the excessive noise I am making “walking in my shoes”. To give you a bit of background information, I am factually the most boring resident in my 16-floor, 300ish unit building. I go to bed at 7:00. I wake up at 6:00. I socialize with others once every six months. I haven’t had anyone over since the nineties. Calls and complaints have taken place, Laughable conversations with the management office have come and gone, and eventually, the situation seemed to absolve itself. I came home from work on a Friday afternoon. This note was taped to my apartment door. Just a reminder, these people do not live below me. My neighbor below me doesn’t exist, as far as I’m concerned. My brother and I decided to take this amazing opportunity to craft response letters to later tape on their door. I hope you like them. Thank you for your note. Yes, I can understand your frustration and I take full responsibility for my lack of respect to you and your schedule. Since you don’t work or seem to do anything of importance, I completely get that the 10 footsteps I make from the counter to the door (in shoes) could easily be a day ruiner for anyone with a shred of sanity. Honestly, I’m surprised you only mentioned my walking on the floor (in shoes). I appreciate you not bringing up my breathing, turning on/off lights (with my hands) and most importantly, eating oatmeal (with my mouth). I’ve done a lot of careful thinking and I think the best solution for everyone is for me to commit solely to crawling around my apartment. My main priority is you, and I have made it my personal life goal to make sure you are never disturbed by my reckless noises again. I was told by management that you are pregnant. Congratulations. The best part about babies (especially newborn babies) is that they believe in complete silence, especially during designated quiet hours. As parents, I know you will make sure that your child is immediately made aware of your schedule and will know from birth that it is not to be tested. So, neighbor I hope this clarifies things. I am spending the rest of the weekend in shul, praying that my G-d forgives me for my sins. Thank you for your thoughtful note. I appreciate you bringing it to my attention–the topic was very enlightening to me and I take the matter very seriously. I must confess that after reflecting on it for the last day, my thoughtless actions that you pointed out have caused me some embarrassment, but hopefully the constructive criticism will make me a better neighbor and better person in general going forward. In my 30+ years as a human being that walks (sometimes with shoes), I failed to realize the negative impact this walking can have on other people’s lives. (I guess that’s one downside to evolution–sure we may be more evolved people in the year 2015, but had we been neighbors say three million years ago before people walked on two legs, my scooting around would have most certainly been less invasive to your sleep patterns. Of course they probably didn’t have high rises in those days so our neighboring huts may not have provided the same level of noise insulation as our building does rendering my polite scooting meaningless, but I digress). 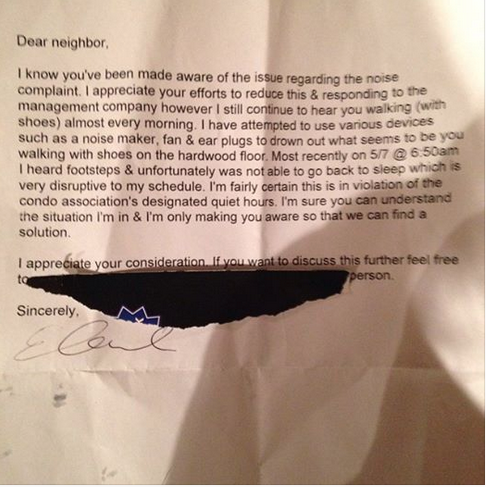 Anyway, you’ve made your point and I’ve committed myself to be a less noisy neighbor. Aside from eliminating walking as a home activity, I wanted to go one step further to show there are no hard feelings. You probably don’t know, but I’m a school teacher by trade and one of the benefits of my job is that I get my summers off. As you might imagine, I try to pack a lot of activities into my summer months, but in light of these recent events I’ve cancelled several of them as a show of good faith to you, my neighbor. I wanted to share this list with you to make sure you realize that I’m trying to be a better neighbor: MAY 15-MAY 29: My good friend has 3 parrots (technically Macaws–the world’s loudest parrots). She is going on vacation to Australia and I had previously agreed to have them stay with me. I watch a lot of Real Housewives when I’m at home and I’m thinking it might be sort of annoying to have 3 loud macaws repeating that dialogue at all hours of the day. As a result, I’ve told my friend that I’ll have to rescind my offer to watch her birds. She doesn’t really have anyone else to watch them, so she’s just going to set them free in Oz Park before she leaves and hope for the best that they’ll still be there upon her return to Chicago. JUNE 1: My uncle bought me a Groupon for 20 home tap dancing lessons for my birthday. My lessons with my teacher, Olga, were supposed to commence on this date and continue you twice a week throughout the summer. The lessons were set for 7 AM (as you know I’m an early riser). I was really excited to learn this craft and even had scheduled to have a lot of friends and family come in over Labor Day so I could perform a recital for them at my home (an early morning recital naturally). This beautiful style of dance would require me to wear shoes though so I’ve let the school know I was backing out. This was particularly devastating for Olga as she was counting on the money from the lessons and she will probably have to move back to Poland now. JUNE 13: One of my favorite things to do is my work as a freelance food blogger. As you probably know, pop up restaurants are very big right now. This is when a chef or restaurant visits an alternate site for a short period of time so that different people can sample their food that wouldn’t otherwise have the opportunity. I’m not sure if you’ve ever been to the Wiener’s Circle, but it’s a great late night hot dog place in Lincoln Park where the cashiers scream obscenities at you when you order your food (side note: we should go together sometime). Since a lot of bar patrons that go out in River North don’t really want to schlep to Lincoln Park after a night of drinking, I thought it would be great to do a pop up in my apartment. I assumed you wouldn’t be into this so I’ve cancelled the event. JULY 4: One of my favorite dates to celebrate being an American. I don’t know about you, but I think fireworks are the true embodiment of a perfect Independence Day. As I do every year, I ordered a pallet of illegal fireworks from this great store on the Indiana border. I like to set them off for like 8 straight hours starting around 10 PM and finishing at sunrise. I’m now going to have sell these items on craigslist. AUGUST 11: As an end of summer treat to myself, I thought it would be cool to have a concert at my apartment. I booked West Coast rapper Too $hort to perform. I was going to invite you and your husband over as he puts on a great show (If you’ve never heard “Dope Fiend Beat” live, you should. It’s Magical). I can cancel him, but I had to give a $25,000 deposit that’s non-refundable. Maybe you’d want to split the cost of that with me since we’re neighbors? No pressure though. Anyway, I hope you can now see that I really do take your letter seriously and you have my genuine commitment to do better. Hopefully, the steps that I’m taking (no pun intended), will bring an end to this tension and result in you getting your well deserved night’s rest. If for some reason the noise is still bothersome though, please reach out again and we can discuss having my legs amputated.